As a relatively new resident of Baltimore and a new volunteer at GHCC, I want to spend some time getting to know the area and the organization. Since I’m a former public school teacher and a parent, Christy—GHCC’s Development Director and the supervisor for my volunteer work—recommended I start by talking to a fellow parent who’s been working with GHCC in the local public schools. I sat down on August 26 with Jennifer DiFrancesco, a mother of two and minister at Second Presbyterian Church on N. Charles Street. This summer, GHCC helped her and other parents at Margaret Brent Elementary/Middle School use direct appeals and social networking to raise over $9000, enough to provide each student with a brand-new uniform for the 2010-11 school year. 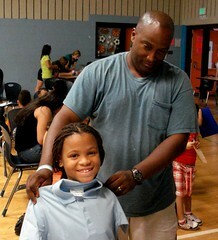 Last week, the school hosted a back-to-school event, where each student was measured for their uniform and everyone went home with a brand-new shirt. GHCC’s Karen DeCamp helped make arrangements for five AmeriCorps*VISTA volunteers to assist with the celebratory event. Kerri has been volunteering with GHCC’s development staff to help with public relations and fundraising efforts. This is her first blog post, but we’ll be hearing more from her as she settles in! To read more about Jenn DiFrancesco’s amazing fundraising efforts for Margaret Brent students, keep an eye on your inbox for this month’s GHCC Digest (or sign up if you haven’t already) or check out her feature in Great Kids Up Close. Join Your Friends and Neighbors for a Night Out at Darker Than Blue Cafe!